CHICAGO – As Disney/Pixar continues to release new films on Blu-Ray, they often “piggy-back” one title with another from their catalog, choosing to release Pete Docter’s first directorial effort for the company, “Monsters, Inc.” in HD on the same day that they release his new film, “Up”. In a beautiful 4-disc combo pack that includes Blu-Ray, DVD, and digital copies of the film, “Monsters, Inc.” continues the Pixar Blu-Ray tradition. CHICAGO – One of the most beloved films of the year and a likely contender for the Oscar for Best Picture now that the category has expanded to ten nominees, Pixar’s “Up” was recently released on Blu-Ray in yet another lovingly produced set from a company that has been a pioneer in the next-gen format. “Up” doesn’t exceed expectations but also doesn’t falter from the critically-acclaimed pattern. CHICAGO – Pixar movie tie-ins can be hard to review simply due to the strength of their source material. Pete Docter’s “Up” is the most critically acclaimed and brilliantly written films of the year. How can a game possibly match “Up”? 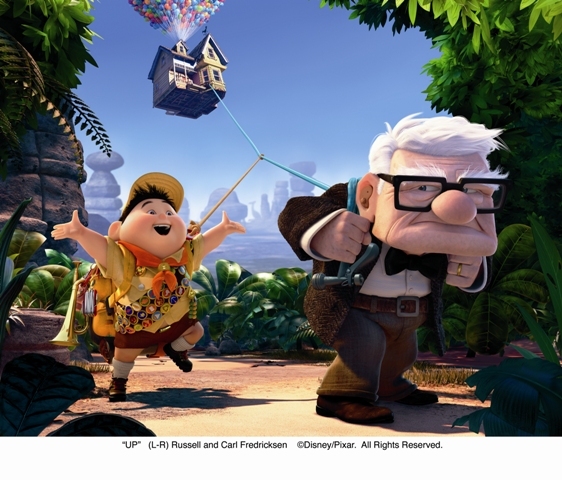 (L-R) Russell and Carl Fredricksen. CHICAGO – This 10-image slideshow contains the official press images for Pixar’s 3-D “Up” featuring voice work by Ed Asner, Jordan Nagai, and Christopher Plummer. The film, written by Bob Peterson and directed by Pete Docter, opens on May 29th, 2009. CHICAGO – Pixar’s “Up” recently became the first animated 3D film to open the Cannes Film Festival and the reviews were just as rapturous as those who had been tracking the latest Pixar offering expected them to be. Before he want to France, director Pete Docter sat down for an exclusive interview with HollywoodChicago.com.